Water footprint accounting has contributed to show that livestock production, and dairy production in particular, have a non-negligible impact in terms of freshwater appropriation (Palhares and Mezzopane, 2015). 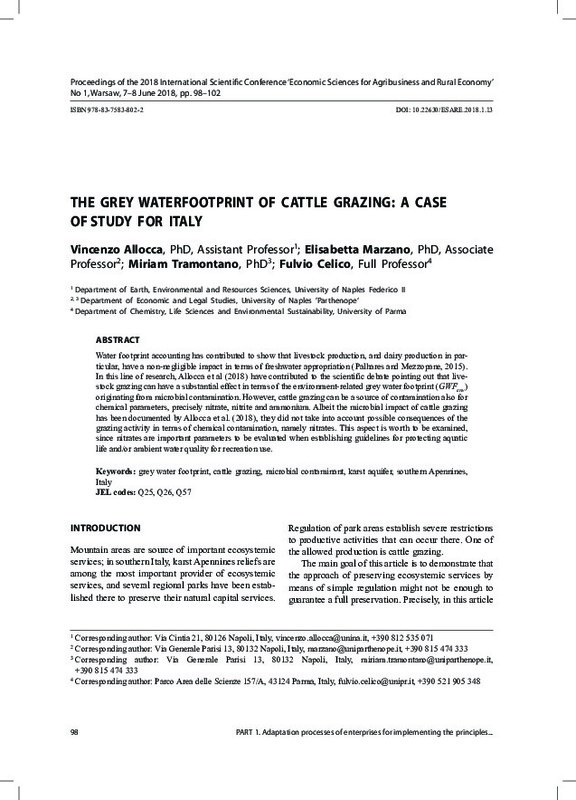 In this line of research, Allocca et al (2018) have contributed to the scientific debate pointing out that livestock grazing can have a substantial effect in terms of the environment-related grey water footprint (GWFenv) originating from microbial contamination. However, cattle grazing can be a source of contamination also for chemical parameters, precisely nitrate, nitrite and ammonium. Albeit the microbial impact of cattle grazing has been documented by Allocca et al. (2018), they did not take into account possible consequences of the grazing activity in terms of chemical contamination, namely nitrates. This aspect is worth to be examined, since nitrates are important parameters to be evaluated when establishing guidelines for protecting aquatic life and/or ambient water quality for recreation use.